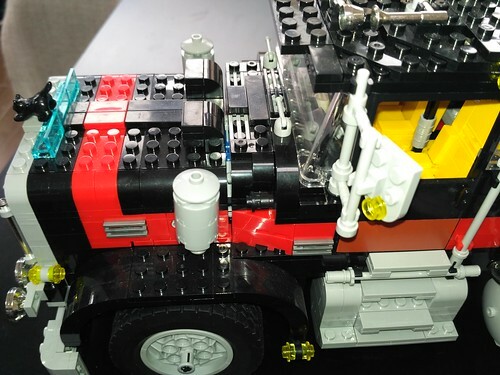 I promised when I bought it that I would write a review of the Lepin knock-off/clone of LEGO Model Team 5571. That was nearly a year ago! Note all images are linked to the flickr album and there are more pics there. Just to be clear, this isn't a review of the set in its own right, just a review of my experience building a Lepin product. I've wanted to own 5571 for as long as I can remember. Unfortunately it averages around €280 used on bricklink, which is more than I'm willing to spend on a Lego set - particularly one with limited playability. So I had written it off as a pipe dream. 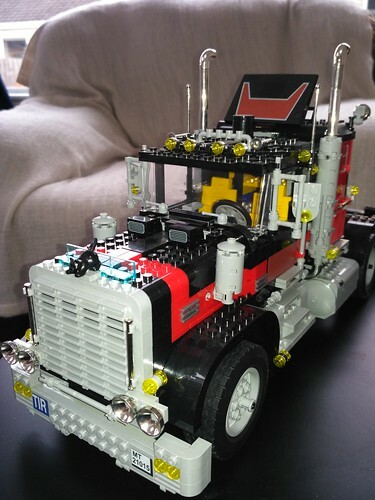 Enter Lepin with their clone for under €100 including shipping on AliExpress! I did as much research as I could on Lepin products in advance before taking the plunge. I'll start with the quality of the bricks. This was pretty much as I expected and as I had read already. There are instances where parts don't hold their connection. The quality of molds is poor. In a stack of bricks you can see that some are out of alignment. I'd say around 15-20% of the connections are significantly weaker than real Lego, and in a some instances parts would not hold together at all. This was ok some of the time - further construction around these parts would hold them in place. However in a couple of instances I had to swap out the part I was trying to use with another identical one because otherwise I would have lost crucial structural connectivity. For this reason alone I would never ever mix Lepin with Lego in a MOC. It's simply a poor quality product. I had read that Lepin's instructions were poor quality but I actually found no issue with them. 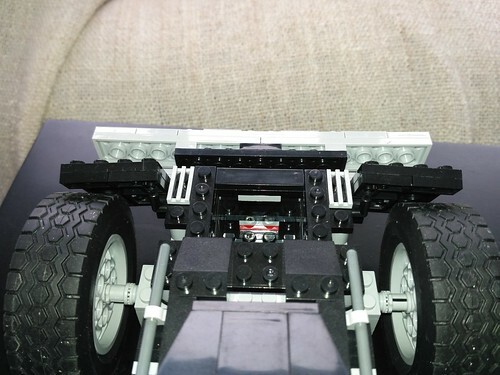 Online reviews said that sometimes they weren't printed in the correct size so the scale guides for measuring Technic axles would be completely useless. Mine was actually perfect, no complaints there. 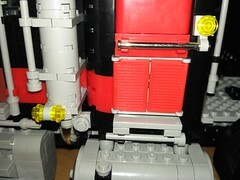 There were two missing pieces for which I had to sub in real Lego - a 2x10 light grey plate and a 1x1 red plate with clip. I couldn't actually find the latter in my collection so I had to use one of these instead. Staying in the same area, the tools that go inside that hatch are significantly larger than their genuine Lego counterparts. This means that you can't actually fit them all in, hence the solitary oil can where there should also be a drill! The drill seems to be almost twice the size it should be. 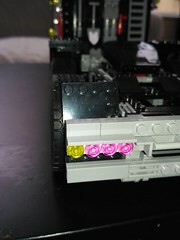 The last issue with parts is the colour of the rear lights. They're not red, they're pink. At least it's easily fixed, I've definitely got plenty of red ones lying around somewhere. Finally, the stickers. They're terrible. They're so thin the colour of the bricks behind them comes through. Below is the red sticker on the door. 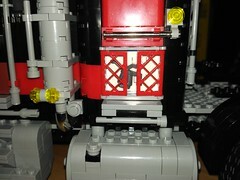 Believe it or not, on the sticker sheet that sticker exactly matched the colour of red Lego bricks. But stick it on a black door and it becomes dark brown. I need to fix it, it annoys the hell out of me, but I still haven't decided how to go about it. Also in the picture you can see a gap between the hood and the cab. I don't know if that's present in the real thing but I doubt it. In conclusion, Lepin doesn't come close to the quality of Lego and I would never buy it again. But there'll also never be a 5571 again and I generally don't really care for models for the sake of displaying them - I buy Lego for building MOCs or for playability in the case of Technic sets. I had a pretty good idea of what I was getting into and I'm happy to be able to display 5571 on my shelf for a fraction of the price. I'll fix the issue with the red lights and the door stickers and you'll hardly be able to tell the difference, and that's all you really need for a display model! If display models are your thing, it's not bad as long as your expectations aren't too high. How about chrome parts? They are good quality?